John Newton (1725–1807) is best known today for his great hymns (including “Amazing Grace” and “Glorious Things of Thee Are Spoken”). But in his own day, he was perhaps more highly prized as a letter writer — “the great director of souls through the post,” as someone described him. Such was the value of his correspondence that he published several volumes of his letters (including one of his letters to his wife, which called forth the comment by one reviewer, his friend Richard Cecil, that wives would be in raptures reading such love letters while “we [husbands] may suffer loss of esteem for not writing them such gallant letters”). 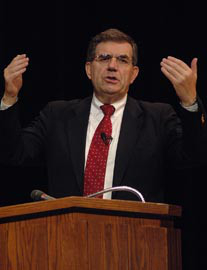 In several of his letters, he comments on the subject of controversy. He had a distaste for it. (It would be an unhappy thing to have a “taste” for it, would it not?) He also had a sense of being unfitted for it. He remarked that it was “not only unpleasing to my taste, but really above my reach.” But lack of experience is not necessarily an obstacle to one’s ability to give biblical counsel. Newton constantly sought to give such counsel. (Did he not encourage William Wilberforce in the great public controversy of slave trading?) In a day when only a paltry number of Anglican ministers were evangelical, he was particularly conscious that Calvinists, being much in the minority, might feel pressed into controversy too frequently. It is surely for this reason that one of his chief concerns was that if we are to engage in controversy, our perspective needs to be dominated by the issue of the glory of God. “If we act in a wrong spirit,” he writes, “we shall bring little glory to God.” The first question of The Westminster Shorter Catechism is relevant here as everywhere: How do I speak, write, or act in situations of controversy so that God may be most glorified? This is the principle. But it needs to be particularized. Newton realized that sometimes we engage in controversy professedly “for the glory of God” but are blind to the ways in which our own motives impact and play out in our speech and actions. The rubric “for the glory of God” must transform how Christians respond to controversy. “For the glory of God” does not call for a monolithic response to every controversy. Circumstances alter cases. We do not cast pearls before swine. Here are three illustrations of controversy. In the first, silence is the appropriate God-glorifying reaction; in the second, confrontation; and in the third, patience. Why such different responses? Isaiah 36 vividly describes how Sennacherib of Assyria attacked Judah. The Rabshakeh (an Assyrian officer) sought to stir up controversy. He spoke, as Hezekiah recognized, “to mock the living God” (Isa. 37:17). But the leaders followed their king’s counsel: “They were silent and answered him not a word” (36:21). The end of the story? God vindicated their response. The angel of the Lord struck down 185,000 Assyrians. Sennacherib retreated. 1. FIGHTING WORDS would not have defended the Lord’s glory here. At such times, we look to the Lord to defend His own glory and not give it to another. 2. WE BEST DEFEND the Lord’s glory by speaking first to Him about unbelieving men rather than speaking first about Him to unbelieving men. Hence Hezekiah’s prayer: “O Lord our God, save us from his hand, that all the kingdoms of the earth may know that you alone are the Lord” (37:20). Alas, not all strong controversialists are strong intercessors. 3. WE CAN MAR the Lord’s glory — as Newton hints — by how we respond to controversy. Man’s insulting God is not reversed by our insulting man. A less public, but no less breathtaking, incident took place in the early church. Imagine the electric atmosphere: Simon Peter had table fellowship with Gentiles. Then “certain men came from James” (Gal. 2:12). Peter separated himself, as did other Jewish Christians, “even Barnabas” (vv. 11–14). How did Paul respond? He “opposed [Peter] to his face” (v. 11). Paul was surely right. But why was this a God-glorifying response, rather than silence in deference to Peter and Barnabas, avoiding embarrassment and potential division? 1. THE PROTAGONISTS were present and believed the same gospel. Paul did not wait and later “bad mouth” Peter. He did the hard thing. He spoke personally and directly to him. That glorifies God because it follows a biblical pattern (Matt. 18:15; James 4:17). 2. THE VERY HEART of the gospel was at stake here (as Paul notes in Gal. 2:15–21). 3. “ORDAINED” MINISTERS of the gospel were involved, not a single, ordinary individual. The deviation of both Peter and Barnabas would lead to the deviation of others and a disastrous disruption of the whole church. God’s glory in the church required direct speech. Some years later, Paul encountered a situation that, at first sight, seems similar. There was an ongoing controversy about “diets and days” in the Roman church(es). Some observed special days and refrained from certain foods. It was presumably a controversy between Jewish and Gentile believers (the latter being the majority in the churches after the expulsion of Jews and Jewish Christians from Rome, see Acts 18:1–2). Paul had an eye to God’s glory. How could the two groups in this controversy “with one voice glorify the God and Father of our Lord Jesus Christ” (Rom. 15:6)? 1. STRIKINGLY, THE “STRONG,” those on “the right side” of the controversy (14:14), are the ones who should refrain from insisting that others adopt their “right” position and practice. The glory of God is best seen when “the strong” welcome “the weak” — because this is what God has done in Christ: “For while we were still weak … Christ died for the ungodly” (5:6). 3. TO INSIST ON exercising one’s “liberty” on a controversial matter (to eat meat, to ignore days, and so on) compromises that very liberty itself. It means we are driven by inner “need” rather than by love. We are focused on self-glory rather than God’s glory. Since “Christ did not please himself” (Rom. 15:3), should we? These examples are by no means comprehensive. But they illustrate Newton’s point. In all things seek God’s glory — and guard your heart. Christians are always in need of that wise counsel.